Still, it is too early to say that the days of guilloche designs are over. They can still be used to prevent the counterfeiting of products that do not require the highest level of security (i.e. theater tickets, diplomas or gift certificates). Or, they can just be used to decorate and add some aesthetic value to a product giving the money-like look and value. Each document in Excentro has three distinct areas to display: Preview, Structure and Layers. Preview and Layers are similar to the windows of other graphic design applications: Preview displays guilloche graphics with the magnifications specified, Layers shows back-to-front order of paths and allows the designer to arrange which objects are below or above. The Structure area is the key highlight of Excentro. It illustrates the process of guilloche construction with graphic objects presented as interconnected bases and elements. With Excentro you can create all popular kind of guilloches: backgrounds, bands, frames, rosettes. The underlying principle is similar to that of mechanical guilloche machines from the past and is based on the movement of drawing an object over a path created in a similar way in previous steps. Excentro allows you to duplicate its graphic objects any number of times with the individual attributes of the objects modified by user defined values. 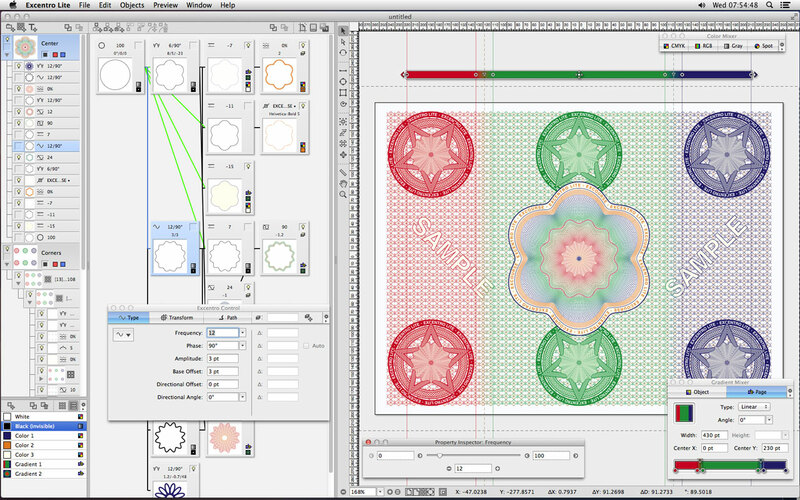 With this Step & Repeat feature, you can create intricate guilloche designs in almost no time with few mouse clicks and keystrokes. If the design needs to be modified or reworked later, you can just change several attributes of existing objects and their Step & Repeat sets to get a design that looks different. 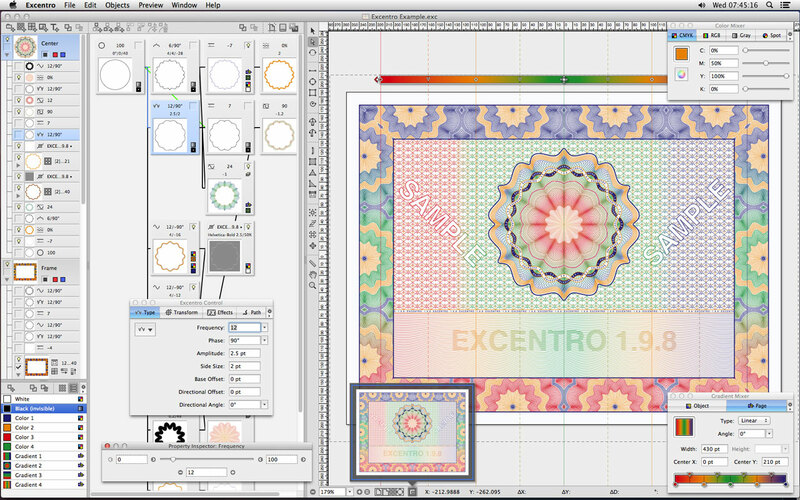 Excentro can cut a part of the existing design, then reflect and repeat this part to create complex borders or backgrounds with symmetrical patterns. You can even automatically create a complete rectangular frame for a certificate or diploma in this way. Adjacent path segments and corners are accurately joined and stitched together to create continuous paths without overlapping line caps. This feature can also be used to crop a background or a border to certain area. The stroke width of background paths can be changed by either modulation settings specified by the user or by the pixel value of the underlying grayscale image. In the similar way portions of paths located over non-white areas of the underlying image can be offset to create bas-relief like effects. Any graphics file in common image formats (raster TIFF or vector PDF) can be imported into an Excentro document to be used with this feature. You can even apply Step & Repeat sets to the images to vary its position, size, brightness or contrast. 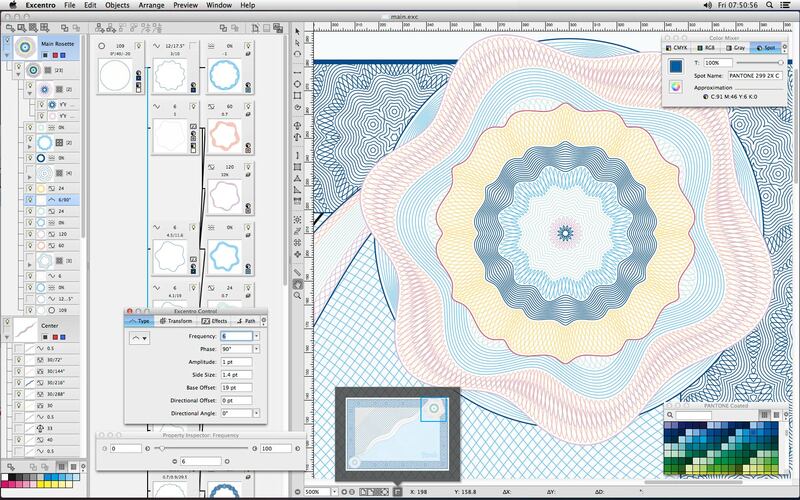 When a guilloche work in Excentro is over you can export the finished design in generic PDF, Adobe Illustrator format or create a preview in TIFF, JPEG or PNG. A PDF file can be directly printed or placed into a page layout application. An Illustrator file can be opened in the Adobe Illustrator application to add some effects. Excentro layers and document settings are fully transferred to this format. Preview image files can be sent to customers for design approval or placed into web pages. You can download this information as a printable data-sheet in PDF-format. It contains full resolution vector artworks (with all them borders and backgrounds) that might serve as an illustration of what typical Excentro output may look like. Excentro, or the full application version, is geared to professional graphic artists who make designs for security papers, certificates, packaging or even plastic cards. This version has all the features mentioned above. System requirements: Apple Macintosh with Mac OS X 10.6 (Snow Leopard), Mac OS X 10.7 (Lion), OS X 10.8 (Mountain Lion), OS X 10.9 (Mavericks), OS X 10.10 (Yosemite), OS X 10.11 (El Capitan), macOS 10.12 (Sierra) or macOS 10.13 (High Sierra). Internet connection is required for software activation. Details: This is Mac OS disk image (DMG) created with Disk Utility application. If you are using non-Macintosh computer to access internet resources, download the file and transfer it to your Mac. Addition of Clipping Masks and Clipping Stroke Masks as a convenience feature. Images for bas-relief effect can now be individually selected. Users who purchased Excentro license before October 1, 2013 may need to update their license serial numbers. This update is free: please send your requests to info@excourse.com. Stability fixes for macOS 10.13 (High Sierra). Minor UI fixes and enhancements. Minor fixes to the application package and UI for smoother experience under macOS 10.12 (Sierra). Fixes issue with text rotation. Some fixes for forthcoming OS X 10.9 (Mavericks) release. More configuration options were added to Stroke Width Modulation effect. Minor enhancements: Snap to Grid option for editing base control points with interactive tools, Coil Growth attribute to control radius of Spiral bases. Text String object now has resize handles to change font size with mouse dragging. Text on Curve object has additional option to choose between Base and Direction paths to define angle for characters rotation. Several fixes for user reported issues. New Image Group object that allows to wrap paths of other objects (including new text objects) into a group that will be used with bas-relief generation effect. Step & Repeat Sets feature and size-center attributes were added to objects of Group/Compound Path type. Internal changes to Group/Compound Path and Cut & Tile objects processing. List of templates and examples was added to New Document dialog. Document Setup dialog now opens as additional panel inside document window and contains new Description field for author comments. Other minor fixes and interface changes. Minor fixes and interface changes. Internal changes that add better support for recent Mac OS X versions. New minimal system requirements: Mac OS X 10.6 or above. Fixes glitches with graphics caching that could cause paths and images to be drawn twice. Some other cosmetic improvements and minor fixes. Adds new objects stroke weight option to New Document and Document Setup dialogs. New preferences options to manage Swatch Palettes. Internal changes to make documents and preferences data saves more reliable (to prevent accidental data loss). Some cosmetic improvements and minor fixes. Adds better graphics caching and multi-threading support. Works faster on multi-core and multi-processor systems. More responsive to user actions. Changed handling of images (for bas-relief effect) to make it less dependent on file formats and somewhat faster. Adds 64-bit code versions for both Intel and PowerPC based Macs. User interface code changes that were required for 64-bit support. Floating Toolbars were removed (as it seems to be the current user interface style). Other cosmetic user interface changes. Some fixes for Mac OS X 10.7 (Lion). New minimal system requirements: Mac OS X 10.5 or above. Minor fixes (accumulated since January 2009). Some minor feature additions (like gradient colors), interface and stability fixes. Excentro Lite is a simplified version with the features set close to the original Excentro from mid 90's. It does not have Tiles, Frames, Reliefs or Pen tools of full Excentro version, but it has a very affordable price point and is made for the users who need to create designs for occasional jobs or just to do some guilloche experiments. System requirements: Apple Macintosh with Mac OS X 10.6 (Snow Leopard), Mac OS X 10.7 (Lion), OS X 10.8 (Mountain Lion), OS X 10.9 (Mavericks), OS X 10.10 (Yosemite), OS X 10.11 (El Capitan), macOS 10.12 (Sierra) or macOS 10.13 (High Sierra). Excentro Lite now can create objects of Group/Compound Path type (like full Excentro version). These objects could be used to group, transform, step and repeat paths of selected objects or parts of design. Elliptic Page gradients now behave identical to that of full Excentro version. pnot and PICT preview resources are no longer saved with the documents (to reduce disk space usage), 256x256 icons are used instead. Place this file in the same folder as Excentro application and you will be able to access it from Help menu of Excentro. This is a quick update that covers some differences in Color Mixer inspector behaviour as well as notes on new Gradient Mixer inspector (introduced with Excentro and Excentro Lite version 1.8). Volume discounts will be applied to purchases of more than one license. Please, do not forget to provide your correct e-mail address. When FastSpring will notify us about your payment we will send you valid serial number by e-mail (allow few hours for this procedure, but on weekends it may take much longer). By entering serial number in Register dialog displayed at application start up you will turn Demo into licensed version. Please, do not forget to deactivate Excentro before moving the license to another Mac computer. Use Deactivate command from Help menu to perform deactivation. We would like to hear feedback on the benefits and shortcomings of our software. Please include your suggestions and comments with information on what hardware and operating system you are using with Excentro.